Dear heavenly Father, for most of my life I have tried to earn Your love and gain Your approval.. and whatever I tried to do, never made me feel that I had done enough - in fact the more I tried to get You to love me.. the more I found that I failed You miserably. And as I look back on the mission trips, ministry activities, times of prayer and the many bible studies I attended.. the more I believed that I must be disappointing to You, because I was not doing as much as I ought to do. Father as I look back at this period of my life, is saddens me to realise what an incorrect perception I had of You.. and Your unconditional love to all Who are saved by grace, through faith in Christ Jesus. 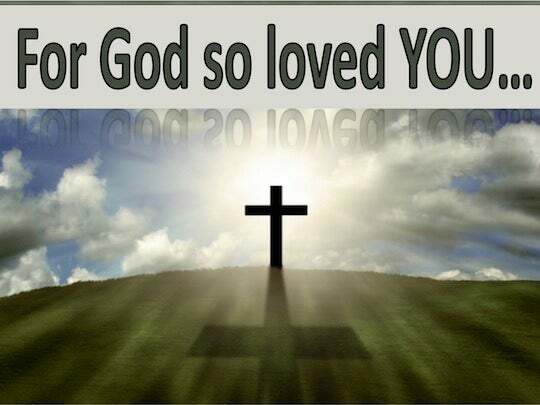 Father forgive me for misrepresenting Your Father-heart of love and thank You for showing me that Your love for me is not dependent on what I can do for You but rests entirely on what the Lord Jesus did for me, on the cross. Thank You that Your approval does not rely on me at all but simply rests on the fact that I believed on the Lord Jesus as my Saviour - and that I am accepted by YOU because of HIM.. accepted in the Beloved because I am a new creation in Christ - clothed in His righteousness and without condemnation.. and all because of Jesus. Help us never to forget that the safest place in a fallen world is to remain in the center of Your will, no matter where we are, who we are with or what circumstances may seem to be looming on the horizon. I pray that I may stay in the center of your perfect will, each day of my life, and that I may walk worthy of my calling and live in a way that is pleasing to You. May I learn to walk by faith each moment of the day and not be swayed by sight or feelings or emotions.. and may I learn to trust Your word more and more with each passing day, knowing that without faith it is impossible to please You - for it is my heart's desire that in all I do and say, I may be pleasing in Your sight. Help me not only to do what is good and acceptable in Your eyes, but help me to speak and think aright. May I live in a right relationship with You, walk humbly before You all the days of my life and I pray that I may develop an attitude of grateful praise and thanksgiving. Help me to water all that I say and do with prayer and may my actions and attitudes be rooted in Your love and surrounded by Your grace. O God, I thank Thee for a little insight into the boundless love of God. I thank Thee for the response in my own heart. I thank Thee for the love of others. Let my heart praise Thee, O God. Father God, I am reinvigorated in my faith and I hunger for God's love in my life. I ask that you continue to hold my hand as I walk towards your light. You have declared the purpose for my life and as I continue to grow closer to you, please do not let go of my hand. Thank you Lord. Amen.